Septimania (French : Septimanie, IPA: [sɛptimani] ; Occitan : Septimània, IPA: [septiˈmanjɔ] ; Catalan : Septimània, IPA: [səptiˈmaniə] ) is a historical region in modern-day south of France. It referred to the western part of the Roman province of Gallia Narbonensis that passed to the control of the Visigoths in 462, when Septimania was ceded to their king, Theodoric II. 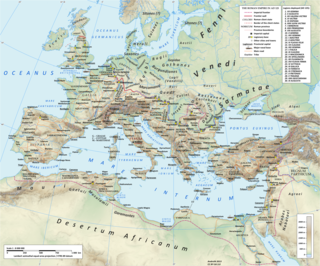 Under the Visigoths it was known as simply Gallia or Narbonensis. Septimania territory roughly corresponds with the former administrative region of Languedoc-Roussillon that merged into the new administrative region of Occitanie. Septimania passed briefly to the Emirate of Córdoba, which had been expanding from the south during the eighth century before its subsequent conquest by the Franks, who by the end of the ninth century termed it Gothia or the Gothic March (Marca Gothica). Catalan is a Western Romance language derived from Vulgar Latin and named after the medieval Principality of Catalonia, in northeastern modern Spain. It is the only official language of Andorra, and a co-official language of the Spanish autonomous communities of Catalonia, the Balearic Islands and Valencia. It also has semi-official status in the Italian commune of Alghero. It is also spoken in the eastern strip of Aragon, in some villages of Region of Murcia called Carche and in the Pyrénées-Orientales department of France. These territories are often called Països Catalans or "Catalan Countries". Béziers is a town in Languedoc in southern France. It is a sub-prefecture of the Hérault department. Béziers hosts the famous Feria de Béziers, centred on bullfighting, every August. A million visitors are attracted to the five-day event. Béziers is a member of the Most Ancient European Towns Network. Legio septima Claudia was a legion of the Imperial Roman army. Its emblem, like that of all Caesar's legions, was the bull, together with the lion. Elne is a commune in the Pyrénées-Orientales department in southern France. 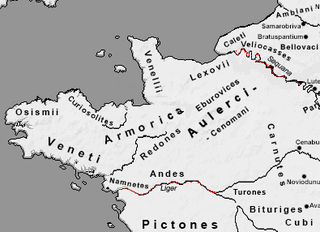 In 462 the Empire, controlled by Ricimer in the name of Libius Severus, granted the Visigoths the western half of the province of Gallia Narbonensis to settle. The Visigoths occupied Provence (eastern Narbonensis) as well and only in 475 did the Visigothic king, Euric, cede it to the Empire by a treaty whereby the emperor Julius Nepos recognised the Visigoths' full independence. The Visigoths, perhaps because they were Arians, met with the opposition of the Catholic Franks in Gaul. The Franks allied with the Armorici , whose land was under constant threat from the Goths south of the Loire, and in 507 Clovis I, the Frankish king, invaded the Visigothic kingdom, whose capital lay in Toulouse, with the consent of the leading men of the tribe. Clovis defeated the Goths in the Battle of Vouillé and the child-king Amalaric was carried for safety into Iberia while Gesalec was elected to replace him and rule from Narbonne. Arianism is a nontrinitarian Christological doctrine which asserts the belief that Jesus Christ is the Son of God who was begotten by God the Father at a point in time, a creature distinct from the Father and is therefore subordinate to him, but the Son is also God. Arian teachings were first attributed to Arius, a Christian presbyter in Alexandria of Egypt. The teachings of Arius and his supporters were opposed to the theological views held by Homoousian Christians, regarding the nature of the Trinity and the nature of Christ. The Arian concept of Christ is based on the belief that the Son of God did not always exist but was begotten within time by God the Father. Armorica or Aremorica is the name given in ancient times to the part of Gaul between the Seine and the Loire that includes the Brittany Peninsula, extending inland to an indeterminate point and down the Atlantic Coast. The toponym is based on the Gaulish phrase are-mori "on/at [the] sea", made into the Gaulish place name Aremorica (*are-mor-ika) "Place by the Sea". The suffix -ika was first used to create adjectival forms and then names. The original designation was vague, including a large part of what became Normandy in the 10th century and, in some interpretations, the whole of the coast down to the Garonne. Later, the term became restricted to Brittany. The Ostrogothic king Theodoric the Great reconquered Narbonne from the Burgundians and retained it as the provincial capital. Theudis was appointed regent at Narbonne by Theodoric while Amalaric was still a minor in Iberia. When Theodoric died in 526, Amalaric was elected king in his own right and he immediately made his capital in Narbonne. He ceded Provence, which had at some point passed back into Visigothic control, to the Ostrogothic king Athalaric. The Frankish king of Paris, Childebert I, invaded Septimania in 531 and chased Amalaric to Barcelona in response to pleas from his sister, Chrotilda, that her husband, Amalaric, had been mistreating her. The Franks however, did not try to hold the province and under Amalaric's successor, the centre of gravity of the kingdom crossed the Pyrenees and Theudis made his capital in Barcelona. During the revolt of Hermenegild (583–585) against his father Leovigild, Septimania was invaded by Guntram, King of Burgundy, possible in support of Hermenegild's revolt, since the latter was married to his niece Ingundis. The Frankish attack of 585 was repulsed by Hermenegild's brother Reccared, who was ruling Narbonensis as a sub-king. Hermenegild died at Tarragona that year and it is possible that he had escaped confinement in Valencia and was seeking to join up with his Frankish allies. Alternatively, the invasion may have occurred in response to Hermenegild's death. Reccared meanwhile took Beaucaire (Ugernum) on the Rhône near Tarascon and Cabaret (a fort called Ram's Head), both of which lay in Guntram's kingdom. Guntram ignored two pleas for a peace in 586 and Reccared undertook the only Visigothic invasion of Francia in response. However, Guntram was not motivated solely by religious alliance with the fellow Catholic Hermenegild, for he invaded Septimania again in 589 and was roundly defeated near Carcassonne by Claudius, Duke of Lusitania. It is clear that the Franks, throughout the sixth century, had coveted Septimania, but were unable to take it and the invasion of 589 was the last attempt. Thanks to the preserved canons of the Council of Narbonne of 590, a good deal can be known about surviving pagan practices in Visigothic Septimania. The Council may have been responding in part to the orders of the Third Council of Toledo, which found "the sacrilege of idolatry [to be] firmly implanted throughout almost the whole of Iberia and Septimania." The Roman pagan practice of not working Thursdays in honour of Jupiter was still prevalent. The council set down penance to be done for not working on Thursday save for church festivals and commanded the practice of Martin of Braga, rest from rural work on Sundays, to be adopted. Also punished by the council were fortunetellers, who were publicly lashed and sold into slavery. The Arabs, under Al-Samh ibn Malik, the governor-general of al-Andalus, sweeping up the Iberian peninsula, by 719 overran Septimania; al-Samh set up his capital from 720 at Narbonne, which the Moors called "Arbuna", offering the still largely Arianist Christian inhabitants generous terms and quickly pacifying the other cities. Following the conquest, al-Andalus was divided into five administrative areas, roughly corresponding to present Andalusia, Galicia and Lusitania, Castile and Léon, Aragon and Catalonia, and the ancient province of Septimania. With Narbonne secure, and equally important, its port, for the Arab mariners were masters now of the Western Mediterranean, al-Samh swiftly subdued the largely unresisting cities, still controlled by their Visigoth counts: taking Alet and Béziers, Agde, Lodève, Maguelonne and Nîmes. By 721 he was reinforced and ready to lay siege to Toulouse, a possession that would open up bordering Aquitaine to him on the same terms as Septimania. But his plans were thwarted in the disastrous Battle of Toulouse (721), with immense losses, in which al-Samh was so seriously wounded that he soon died at Narbonne. Arab forces, soundly based in Narbonne and easily resupplied by sea, struck in the 720s, conquering Carcassonne on the north-western fringes of Septimania (725) and penetrating eastwards as far as Autun (725). In 731, the Berber lord of the region of Cerdagne Uthman ibn Naissa, called "Munuza" by the Franks, was an ally of the Duke of Aquitaine Odo the Great after he revolted against Cordova, but the rebel lord was defeated and killed by Abdul Rahman Al Ghafiqi, so opening Aquitaine to the Umayyads. After capturing Bordeaux on the wake of duke Hunald's detachment attempt, Charles Martel directed his attention to Septimania and Provence. While his reasons for leading a military expedition south remain unclear, it seems that he wanted to seal his newly secured grip on Burgundy, now threatened by Umayyad occupation of several cities lying in the lower Rhone, or maybe it provided the excuse he needed to intervene in this territory ruled by Gothic and Roman law, far off from the Frankish centre in the north of Gaul. In 737 the Frankish leader went on to attack Narbonne, but the city held firm, defended by its Goths and Jews under the command of its governor Yusuf, 'Abd er-Rahman's heir. Charles had to go back north without subduing Narbonne, leaving behind a trail of destroyed cities, i.e. Avignon, Nîmes and other Septimanian fortresses. Around 747 the government of the Septimania region (and the Upper March, from Pyrénées to Ebro River) was given to Umar ibn Umar. In 752 Pippin headed south to Septimania. 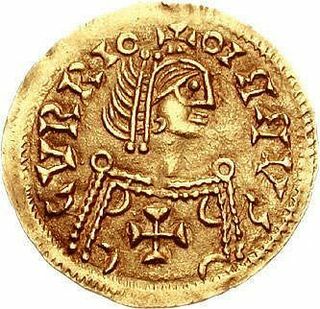 Gothic counts of Nîmes, Melguelh, Agde and Béziers refused allegiance to the emir at Cordova and declared their loyalty to the Frankish king—the count of Nîmes, Ansemund, having some authority over the remaining counts. The Gothic counts and the Franks then began to besiege Narbonne, where Miló was probably the count (as successor of the count Gilbert). However, the strongly Gothic Narbonne under Muslim rule resisted to the Carolingian thrust. Moreover, attacks on the rearguard by a Basque army under the Aquitanian duke Waifer didn't make things easy to Pippin. In 754 an anti-Frank reaction, led by Ermeniard, killed Ansemund, but the uprising was without success and Radulf was designated new count by the Frankish court. About 755 Abd ar-Rahman ibn Uqba replaced Umar ibn Umar. 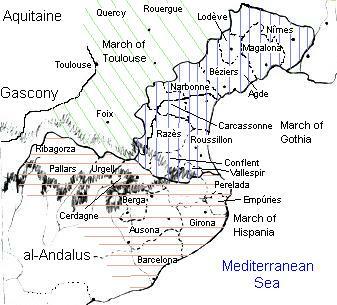 Narbonne capitulated in 759 only after Pippin promised the defenders of the city to uphold the Gothic law, and the county was granted to Miló, the Gothic count in Muslim times, thus earning the loyalty of Septimania's Goths against Waifer. The region of Roussillon was taken by the Franks in 760. Pepin then diverted northwest to Aquitaine, so triggering the war against Waifer of Aquitaine. Albi, Rouergue, Gévaudan and the city of Toulouse were conquered. In 777 the wali of Barcelona, Sulayman al-Arabi, and the wali of Huesca Abu Taur, offered their submission to Charlemagne and also the submission of Husayn, wali of Zaragoza. When Charlemagne invaded the Upper March in 778, Husayn refused allegiance and he had to retire. In the Pyrenees, the Basques defeated his forces in Roncesvalles (August 15, 778). The Frankish king found Septimania and the borderlands so devastated and depopulated by warfare, with the inhabitants hiding among the mountains, that he made grants of land that were some of the earliest identifiable fiefs to Visigothic and other refugees. Charlemagne also founded several monasteries in Septimania, around which the people gathered for protection. Beyond Septimania to the south Charlemagne established the Spanish Marches in the borderlands of his empire. The territory passed to Louis, king in Aquitaine, but it was governed by Frankish margraves and then dukes (from 817) of Septimania. 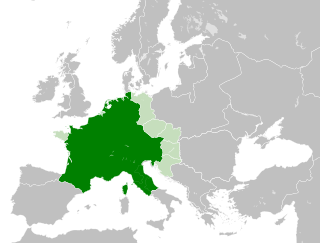 The Frankish noble Bernat of Septimania was the ruler of these lands from 826 to 832. 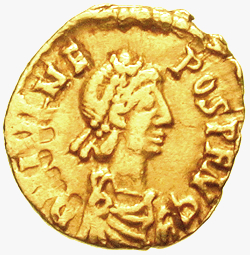 His career (he was beheaded in 844) characterized the turbulent 9th century in Septimania. His appointment as Count of Barcelona in 826 occasioned a general uprising of the Catalan lords (Bellonids) at this intrusion of Frankish power over the lands of Gothia. 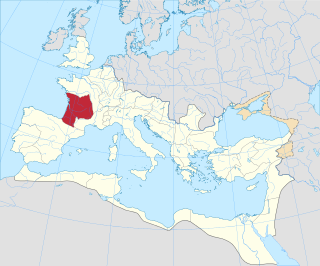 For suppressing Berenguer of Toulouse and the Catalans, Louis the Pious rewarded Bernat with a series of counties, which roughly delimit 9th century Septimania: Narbonne, Béziers, Agde, Magalona, Nîmes and Uzés. Rising against Charles the Bald in 843, Bernat was apprehended at Toulouse and beheaded. Bernat's son, known as Bernat of Gothia, also served as Count of Barcelona and Girona, and as Margrave of Gothia and Septimania from 865 to 878. Septimania became known as Gothia after the reign of Charlemagne. It retained these two names while it was ruled by the counts of Toulouse during early part of the Middle Ages, but other names became regionally more prominent such as, Roussillon, Conflent, Razès or Foix, and the name Gothia (along with the older name Septimania) faded away during the 10th century, as the region fractured into smaller feudal entities, which sometimes retained Carolingian titles, but lost their Carolingian character, as the culture of Septimania evolved into the culture of Languedoc. This fragmentation in small feudal entities and the resulting fading and the gradual shifting of the name Gothia are the most probable origins of the ancient geographical area known as Gathalania or Cathalania which has reached our days as the present region of Catalonia. The name was used because the area was populated by a higher concentration of Goths than in surrounding regions. The rulers of this area, when joined with several counties, were titled the Marquesses of Gothia (and, also, the Dukes of Septimania). ↑ Netburn, Deborah (24 February 2016). "Earliest Known Medieval Muslim Graves are Discovered in France". Los Angeles Times. ↑ Newitz, Annalee (24 February 2016). "Medieval Muslim Graves in France Reveal a Previously Unseen History". Ars Technica. ↑ "France's Earliest 'Muslim Burials' Found". BBC News. 25 February 2016. ↑ Gleize, Yves; Mendisco, Fanny; Pemonge, Marie-Hélène; Hubert, Christophe; Groppi, Alexis; Houix, Bertrand; Deguilloux, Marie-France; Breuil, Jean-Yves (24 February 2016). "Early Medieval Muslim Graves in France: First Archaeological, Anthropological and Palaeogenomic Evidence". PLOS ONE. 11 (2): e0148583. doi:10.1371/journal.pone.0148583. PMC 4765927 . PMID 26910855. James, Edward (1980). "Septimania and its frontier: an archaeological approach". In Edward James. Visigothic Spain: New Approaches. Oxford: Clarendon Press. Zuckerman, Arthur J. (1972) . A Jewish Princedom in Feudal France 768–900. New York: Columbia University Press. ISBN 978-0-231-03298-8. Villeneuve-lès-Maguelone is a commune in the Hérault department in the Occitanie region in southern France. The history of Toulouse, in Midi-Pyrénées, southern France, traces back to ancient times. After Roman rule, the city was ruled by the Visigoths and the Merovingian and Carolingian Franks. Capital of the County of Toulouse during the Middle Ages, today it is the capital of the Midi-Pyrénées region. Gaucelm was a Frankish count and leading magnate in Gothia during the reign of Louis the Pious. He was initially the Count of Roussillon from about 800, but he received Empúries in 817 and was thenceforward the chief representative of imperial authority in that region. Al-Samh ibn Malik al-Khawlani was the Arab governor general of Al-Andalus from between 719 and 721. The title Prince of Gothia or Prince of the Goths was a title of nobility, sometimes assumed by its holder as a sign of supremacy in the region of Gothia and sometimes bestowed by the sovereign of West Francia to the principal nobleman in the south of the realm, in the ninth and tenth centuries. Sometimes hereditary and sometimes not, the title has been rendered in English as Dukeof Septimania or Dukeof Gothia. A similar or the same "office" was often held with the title comes marcæ Hispanicæ: "Count of the Spanish March." The title was also a chronicler's device and, as presented in some chronicles, may never have been used in any official capacity. Septimania was the western region of the Roman province of Gallia Narbonensis that passed under the control of the Visigoths in 462. It passed briefly to the Emirate of Córdoba in the eighth century before its reconquest by the Franks, who by the end of the ninth century termed it Gothia. This article presents a timeline of its history. 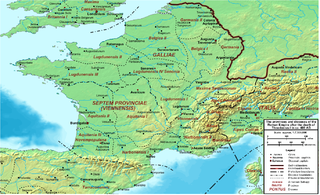 The Diocese of the Seven Provinces, originally called the Diocese of Vienne after the city of Vienna, was a diocese of the later Roman Empire, under the praetorian prefecture of Gaul. It encompassed southern and western Gaul, that is, modern France south and west of the Loire, including Provence. 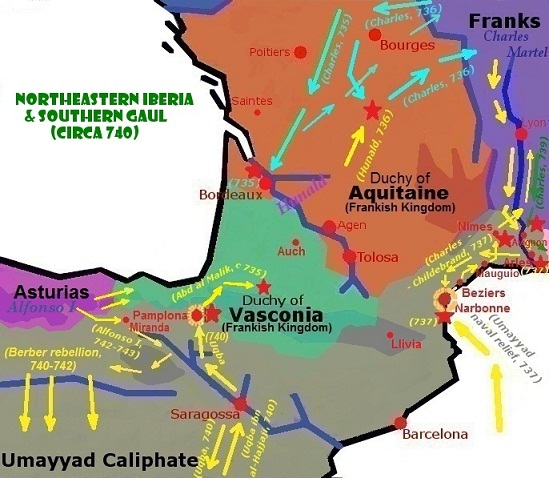 The Umayyad invasion of Gaul in 720 followed immediately on the Umayyad conquest of Hispania. During the 8th century, Umayyad armies conquered the region of Septimania, the last remnant of the Visigothic Kingdom. The Siege of Narbonne took place between 752 and 759 led by Pepin the Short against the Umayyad stronghold defended by an Andalusian garrison and its Gothic and Gallo-Roman inhabitants. The siege remained as a key battlefield in the context of the Carolingian expedition south to Provence and Septimania starting in 752. The region was up to that point in the hands of Andalusian military commanders and the local nobility of Gothic and Gallo-Roman stock, who had concluded different military and political arrangements to oppose the expanding Frankish rule. Umayyad rule collapsed by 750, and Umayyad territories in Europe were ruled autonomously by Yusuf ibn 'Abd al-Rahman al-Fihri and his supporters.